Here's my new Rock Lobster, with a photo and a review. I’ve provided links to both of his blogs, “What’s Up In Santa Cruz”, and “Can’t We Just Get Along?”. They give you a good idea of Paul’s personality and views about framebuilding and the business. You won’t find his order form very detailed, but don’t get dissuaded by it. My experience was it’s not a “be all, end all” document. It just gives him a general idea of what he’s building for you. If necessary, add your own page with more information. During that initial phone call, he’ll even give you a realistic lead time for your frame. The 4 1/2 months he quoted for me was quite reasonable and he apologized for the “delay” explaining he was in the middle of delivering bikes for the upcoming cyclocross season. He delivered the finished frame on time. The week he was ready to build my frame, he called to finalize things. Rather than a “my way or the highway” mentality, he was very willing to listen to my desires on some of my bike’s dimensions and features. My body dimensions aren’t unusual and nor was the frame I was asking for; perhaps that’s why he was so easy to work with. The phrase I kept hearing from him was, “ I just want you to be happy”. Funny thing about the top tube length: I had asked for a 5mm shorter top tube versus my Salsa Ala Carte. During the week he was building the frame, I was fooling with my seat position and moved it forward 5mm. Then crazy ideas started running through my head, “AHHHH! NOW THE FRAME WILL BE TOO SHORT!” I had to laugh and just embrace what would come. Paul kept me updated with the frame’s progress and even posted photos of the bare frame on his blog. He gave me lead times for the powdercoater and painter for the clearcoat. Paul even sent me a note to tell me there’d be a delay because the painter sanded through the clearcoat and muffed a decal. When it was shipped he e-mailed me a tracking number so I could peak at its progress every night before I went to bed. The frame is built with Tange Prestige Ultimate Extrastrong. I told Paul I didn’t need anything extra stiff or light. I was interested in a frame that could take day-to-day use. He said the tubes he used are new old stock that he was able to pick up cheap some time after it was out of production. The unique feature is the top and down tubes: they’re not quite round. Instead, think of a hexagonal or octagonal cross-section. Same concept except there are MANY more sides. It’s something you can barely see through the powdercoat but can feel with your fingers. Paul seemed pretty excited about these tubes and said they were quite dent resistant. It’s with details like this that you put your trust in the builder. I asked for the bike to be powdercoated olive drab and provided a RAL powdercoat number so there’d be no confusion. I also asked for a satin or flat clearcoat but instead I received a gloss finish. When I mentioned this to Paul, he didn’t hesitate to tell me to ship it back for a refinish, or as compensation he offered some unspecified schwag. If this were a road frame I’d probably take Paul up on his offer. 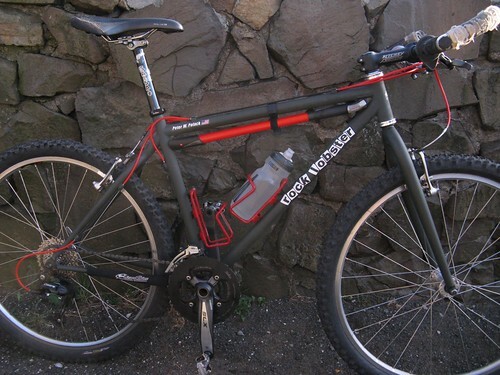 But since it’s a mountain bike and scarring comes with the territory, I couldn’t justify it and would feel sorta sheepish asking for a refinish of a frame that’s destined to be abused. And to tell the truth, the bike got scratched on it’s first foray into the woods and it’s all behind me now. Also during assembly, I noticed there was a run in the clearcoat on the back of a fork leg and a peculiar chip in the clearcoat on the top tube. In full disclosure, I didn’t notice the chip during assembly and had originally placed a sticker on that spot. A day or two later I changed my mind and removed it; only later, still before the bike hit the road or dirt, did I notice it. Whether the chip preexisted the sticker or the sticker pulled the clearcoat off with it, I don’t know. 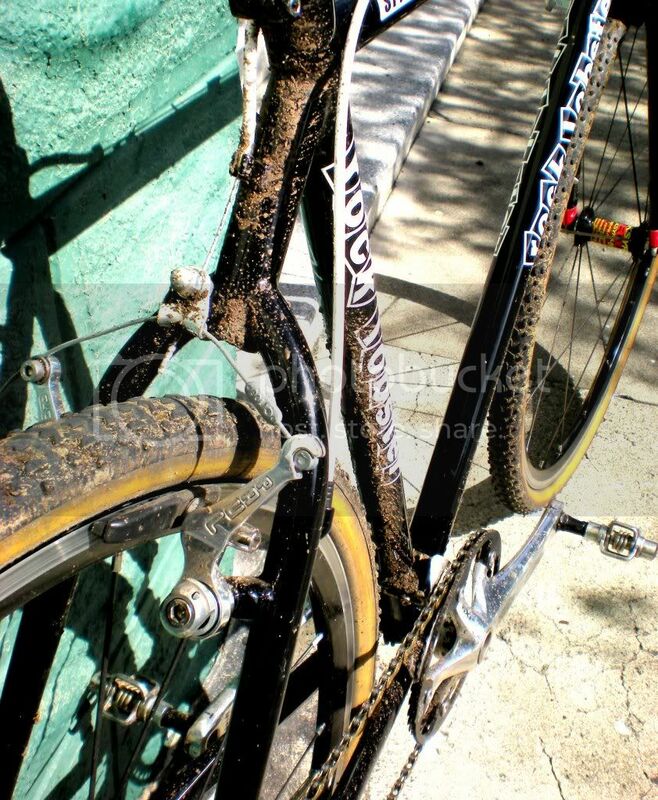 After the first off-road ride with its requisite crashes, I scratched the fork leg-see the Flickr photos. I think there’s something wrong with the clearcoat because it’s not “one” with the paint. Instead, when the bike gets scratched, it peels like a film. I still think something went wrong with the application of the clear, but I’m gonna let it go. I mentioned this to Paul and he didn't hesitate to offer to have the clearcoat redone. He later confirmed he has the same problem with his 5 year old personal frame, and thinks the painter didn't prep the frame well to receive the clear, and this problem is rare with the painter he uses. Check out the front dropouts. Even though I’m using rim brakes the dropouts are still oriented to address the problem of disc brake forces on the front wheel. It doesn’t affect wheel removal or installation onto a roof rack. Whether it was intentional or not, I don’t know. It just looks funky and unique. The fork itself sports larger, round tubes that taper less than the oval/round blades on the Independent Fabrications fork I had on my Salsa Ala Carte. I was worried I would be in for a harsh ride. Frankly, I can’t tell the difference. The headtube is externally machined, yet so lightly you’ve got to wonder why bother since the weight savings is practically nil. Paul does it because he “likes the looks of it”. And the welding; look at the welds. They’re TINY. Smaller than fillets, for sure, but just as smooth, and Paul says he leaves them unfinished because otherwise you compromise the strength of the joint. They’re so tiny you wonder what’s holding the frame together. I never would have noticed them had someone else not pointed them out, but I lack the refined taste to appreciate this stuff. There’s a lot of work in the rear triangle, too. Both the seatstays and chainstays are slender enough to be at home on a road bike, a contrast to the beefier tubes on my Salsa. Perhaps they were chosen to match my lightweight 130 lbs., I don’t know. And both sets of stays have subtle, extra bends in them, similar to a Speedvagen though I don’t want to imply he’s a copycat. And he’s certainly not, considering the trademark monostay rearend, the first bike I’ve had with a monostay. Paul installed all the braze-ons I asked for with no mistakes, from the fender mounts to the pump peg to the waterbottle locations, including the Columbine chainwatcher I asked for. Actually, he said he couldn’t get a Columbine in steel so he promised to fabricate something from a pump peg that would work. It’s a little bit over the top style-wise; a simple nail would have been fine, but it works great. The V-brake spacing on the fork and stays is a bit wider than on my Salsa such that I had to shift the pad spacers around, but the spacing allows me to remove either wheel without having to push the knobs past the pads. Paul says the spacing is to Shimano spec. So how’s it ride? Honestly, I’d be hard pressed to notice any difference between my Rock Lobster and my near deceased Salsa. I’ve only had one ride in the woods so far and it looks like with the snow that my mountain biking season is going to be over until the spring, so I can’t be too definitive on the ride. But the fork didn’t seem harsh and neither did the frame. It’s off-road manners are just fine. Paul only needs to coax his painter to improve on his clearcoating skills to ensure a top-notch frame. I enjoy the bike and I’m proud to count myself among the owners of a Rock Lobster frame. April 2010-I caved in and sent the frame back to Paul at Rock Lobster because of the chipping of the clearcoat on the fork I commented on above. I had barely ridden the bike a half dozen times. He didn't hesitate to accept responsibility. While he was at it, I asked for the matte clear I should have received with the original order. The turnaround time was reasonable and he always kept me updated on my frame's progress. The new finish feels like finely sanded paint; you'd swear there was no clear coat on it al all, but Paul confirmed it's there. 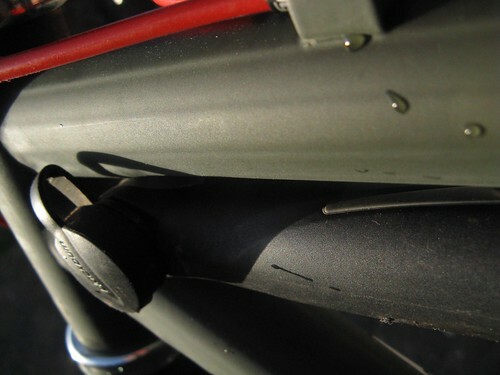 In the top tube photo you can clearly see the external ribs on the Tange tubes. Nice bike, Peter! Thanks for sharing your story. 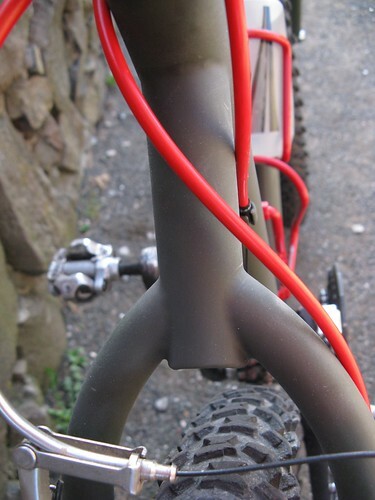 I've always been intrigued by Paul's aluminum cross frames and I have fond memories of viisting Santa Cruz years ago. Good stuff. THAT is a well thought out bike that keeps it simple. Ride that thing any and everywhere. V's, gears, pump, fork built for the frame???Awesomeness. Paul does use a local powdercoater as his basic treatment. 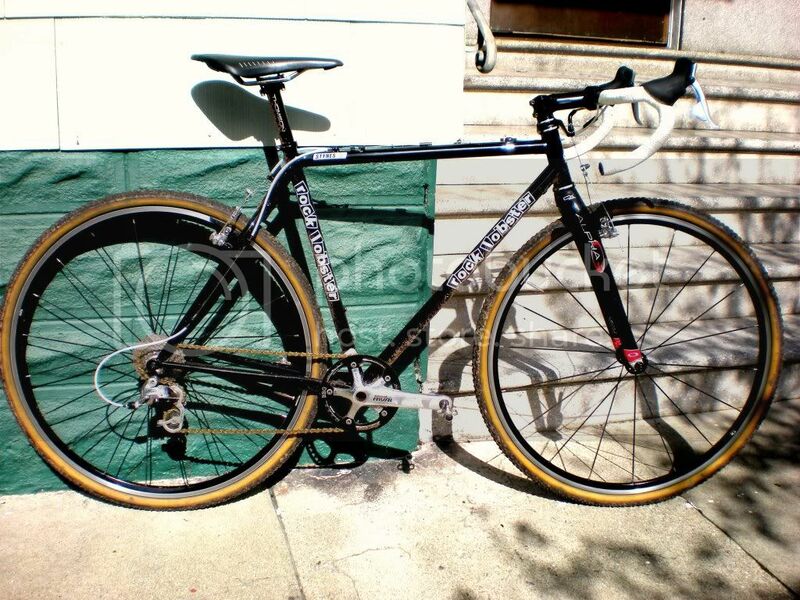 I had him use Spectrum for my Rock Lobster as I wanted something a bit fancier, and they impressed me at NAHBS. He'd never used Spectrum before so he gave me the wholesale rate on my paint since it was allowing him an opportunity check out their work. I believe some powdercoaters use a liquid clear on top of the powder which is not nearly as durable as powder. Spectrum uses a powder clear which does not add a fragile layer onto the durable powdercoat. I'd bet that the chip occurred after the frame shipped. Paul inspects the frames pretty well before they go out. He pointed out some very minor defects (a small run near the BB lug) in the powder coat on my frame that I would never have noticed. Having paid full rate for a fancy powder coat on another frame, I can tell you that going to Spectrum powder would probably add about $500-600 to your frame costs. Is is worth it? That's a personal decision. I think Paul views bikes very much as tools and would probably lean toward the local powdercoater based on costs. But, he is definitely willing to send out to Spectrum if you want on of the best powdercoats in the country. You're right about the balanced cockpit. I've seen many of his frames and I've never felt that any of them look unbalanced. Usually, it's just so perfect that it slaps you in the face. Thanks for the details on the process. I just started communicating with Paul about a new frame last week and I'm glad to hear your perspective. I'm looking forward to an equally sweet ride. Very well done. That is a great frame - looks stylish - a keeper no doubt. I love all of the little touches. Seeing your flickr page - you had posted issues with a previous attempt at a custom mtb. Glad this one turned out better. i had a run of steel stems made by Paul - they were lovely products and yes his tig welding looks great. The bike looks great Pete. Nice write-up about it also. I think the red cable housings,pump, and cages look great! I caved in and had the paint flaws fixed! See the original post for the update. It's so funny with small builders like this. There's no appreciable reason for me to like rock lobsters more than any other small framebuilder, but it's always been one of my favorite bike companies. I'm predisposed to liking them. 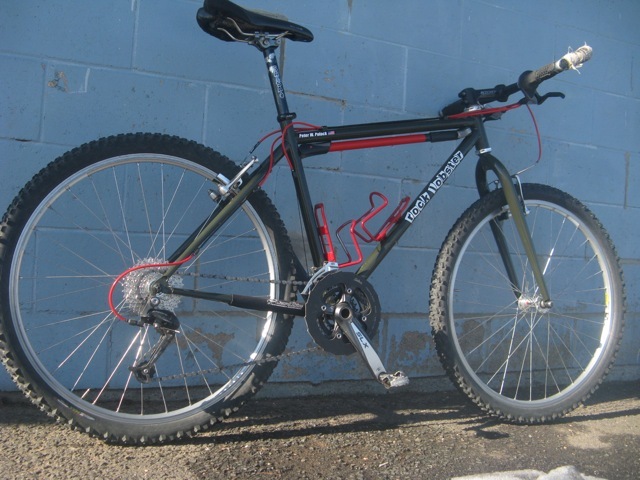 This one is my cross bike, one of the last scandium gx2 tubesets that Paul had. I am loving it and cannot wait for cross! New to the forum, but really enjoying it. 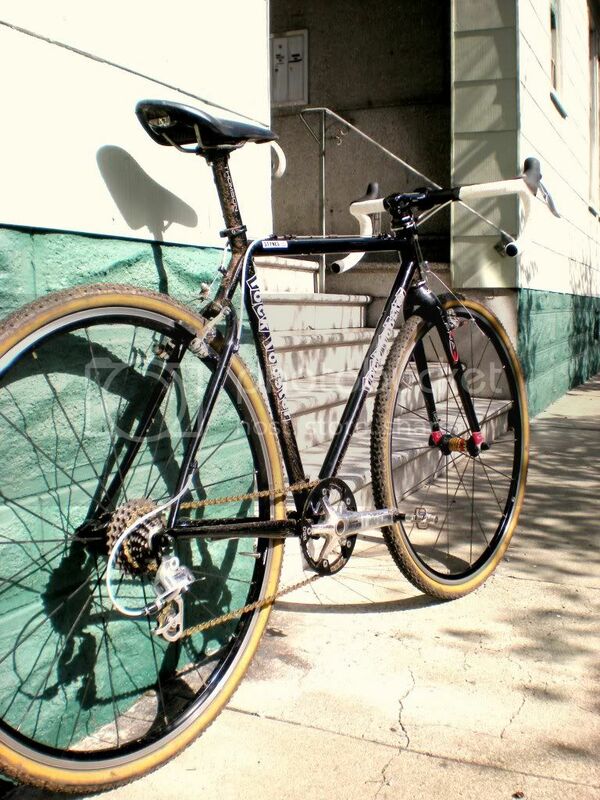 Here is my Custom Rock Lobster Cyclocross. Mostly True Temper OX Platinum, Sram Rival Build. I had Paul do a special wishbone seat stay for me to stiffen up the Euro frameset he does. He was super nice and very professional. Here are some pics, post ride in Golden Gate Park this morning. Here is the new road rig. Still waiting on the new ankle. Second MRI coming up next week or two. Yes, it's a straight post. Narrow clamp+long rails = the saddle is in the same place that on old-style Regal was when it was slammed back on an Ultegra post. Stuff changes. Meh. Great bike Doofus! what fork are you running? I like the painted to match. So you designed around a straight post? slacker STA? What were the conscious choices that lead to that? Aesthetics? Looks great, Doof. Great color, too. More green than the seafoam rig you had before. Are you sourcing these colors from classic cars? I set it up with a Ritchey 20mm setback post and cussed. It was 9cm of saddle setback with the saddle in the middle of the rails. The Ritchey clamp is narrower than the Ultegra one, which puts the saddle further back. The new Regale has longer rails than the old Regal, which puts the saddle further back. different stuff lines up differently. that's why they make different stuff. Terrific looking bike Doof. Still looking for homes for mine if you know of anyone who wants a cool 55. Mine are even the scandium ones. it's the seafoam that Paul uses on the Rock Lobster 'cross team bikes. so, it's kins of his signature color. Looks awesome! Is this ankle issue likely to be able to be resolved? Sounds like it's been a serious problem for a pretty long time. You been playing football on the side as Brett Favre's body double? He has ankle issues too. In the big picture it's pretty minor -- inflammation of the tendon sheath. but, it has apparently been stubbornly slow to heal. the MRI will help indicate whether it's a matter of just resting it for more weeks, doing a fairly simple operation called a debridement, or putting it in a cast to completely rest it for a while. I'm thinking definitely back on the bike by Halloween or Thanksgiving. With changing jobs and moving this summer, and my father-in-law's death back in March, I'm actually kind of glad I haven't touched a bike since Feb 1. I guess it could be a blessing in disguise, but that bike looks awesome. Have you at least been able to ride it a few miles to get a feel for how it is?